As a part of developing a technical illustration business in the 1980’s, Randal Birkey did many illustrations as “self-promotion.” These projects were designed to push skills and abilities further and to show prospective customers what could be done. 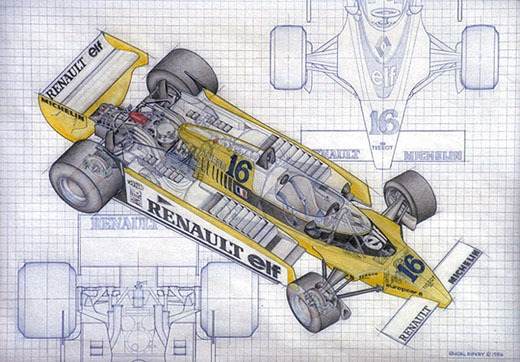 This pen and ink line art illustration of a Renault Elf Formula One racing car was carefully constructed by the illustrator using a scale model as a reference. The right front and rear tires were shown transparently to reveal the brake systems. 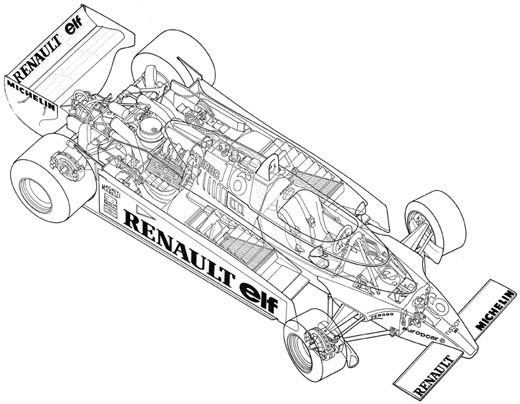 The top body panel was rendered transparent to reveal the driver cockpit area. The top rear body panels were also shown transparently to reveal engine intake and exhaust components. Randal went on to finish this illustration in color and it was used on a number of his self-promotion ads during the 1980’s and early 1990’s.